Since Guangxi is in the south of China, many of its local snacks contain rice. However, the locals of Guangxi have become rather innovative with their rice and have managed to adapt it into a variety of forms, all of which are delicious and incredibly filling. These snacks are so popular that they are found throughout China but are particularly prolific in Guangxi, where local recipes have been honed to perfection. Most of these “snacks” are actually large enough to constitute a whole meal, but we’re sure even a large helping of these tasty treats won’t be enough once you’ve tried them! Guilin rice noodles are considered one of the Four Treasures of Guilin and this is mainly because, in spite of being a snack, they somehow pack in more flavour than a festival banquet! 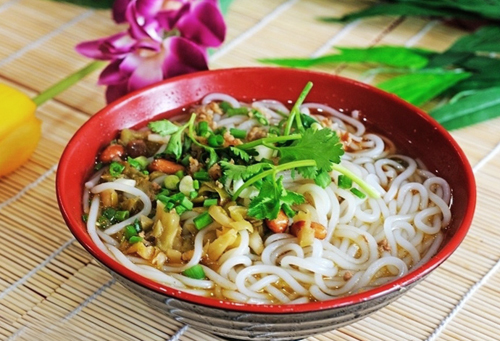 Recipes for Guilin noodles have been refined over thousands of years and the history of this dish dates all the way back to the Qin Dynasty (221-206 B.C.). According to legend, during his reign, Qin Shi Huang sent some of his soldiers down south to help integrate the southern provinces. In the north, these soldiers were used to their staple diet of noodles and found the rice-based meals of southern China unpalatable. In order to combat this problem, the Army General found a way of powdering the rice down into flour, which he then used to make noodles. These rice noodles became so popular with the locals that, long after the army left, they continued to be a staple dish in southern China. These thick rice noodles come in two varieties: round-shaped and flat-shaped. They are usually served with a sumptuous broth, which is the key ingredient of Guilin noodles. The broth is boiled for several hours and contains a multitude of ingredients, such as dried tangerine peel, cinnamon, and ginger, but there is currently no exact recipe for Guilin noodles. Vendors will each have their own, unique recipes for the broth, some of which contain upwards of 20 ingredients, and they guard these recipes fiercely. Thus far, no vendor has disclosed its recipe to the public so, if you want to try this tantalising dish, you must go to the source! The noodles are typically sprinkled with shreds of tender beef, pork or horse meat and served with a range of garnishes, including pickled white radish, pickled green beans, crushed chillies, garlic, chopped spring onion, coriander, soy sauce and many more. Although changfen is a Cantonese-style dish, it is a popular snack in Nanning and variations on the traditional recipe abound in the city. The history of the dish stretches back to the Qing Dynasty (1644-1912) and, with its mouth-watering sauciness, it’s easy to see why it has remained popular for so long. In English, it is sometimes referred to as steamed vermicelli roll or rice noodle roll. The first step is to get a well-balanced mixture of rice flour, glutinous rice flour and water, and spread the mixture thinly onto a steel tray. This mixture must be exact because otherwise the “skin” of the changfen will be too chewy, too gummy or too thick. The mixture is then steamed until it forms the “skin”. This skin is thinner than the skin used to make dumplings and it has more elasticity. The skin is then covered in a variety of fillings, including tender minced beef, pork and chopped green onions, and dried or fresh shrimp, which are further steamed until cooked through. The cooked filling is rolled up into the skin to form a cylinder. The perfect changfen should be a little transparent, so you can just see the filling inside the roll. A liberal helping of sweet, aromatic soy sauce is poured over the changfen and it is served, sometimes with a splash of plain or flavoured oil to add a touch of excitement. 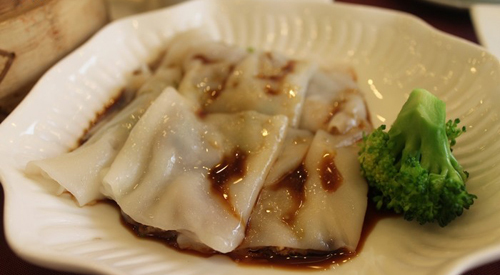 The skin of the changfen will generally taste the same but the filling and sauce will differ widely between vendors. Changfen are characterised by their juicy, moist flavour, which is both salty and a little sweet. This traditional snack is popular throughout China but is prolific in Guangxi and other regions of South China. The making of zongzi is usually a family activity and methods for making them will be passed down through generations. Although zongzi are available year-round, they are traditionally eaten during the Dragon Boat Festival. This festival takes place in honour of the poet Qu Yuan, who committed suicide by throwing himself into the Miluo River. Zongzi are designed to resemble the rice packets that were thrown into the river to distract the fish and deter them from eating his body. Tragic though it may seem, during festival time the Chinese people eat zongzi to commemorate this noble man’s sacrifice. In English, zongzi are sometimes referred to as rice dumplings or sticky rice dumplings, but this doesn’t accurately convey what they actually are. Zongzi are made using glutinous rice, which is first lightly cooked by stir-frying it or soaking it in water for an extended period of time. 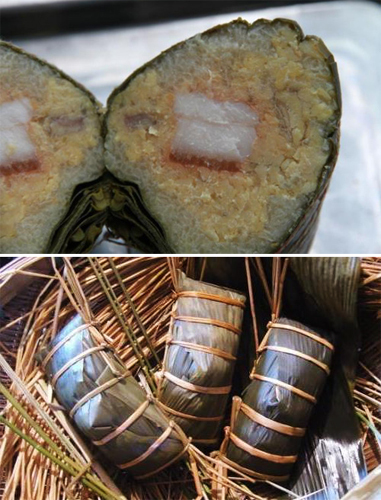 The glutinous rice is then carefully wrapped in bamboo leaves, although some variations include using lotus, maize, or banana leaves to give the rice a slightly different flavour. Along with the rice, a variety of fillings can be added to make the zongzi savoury or sweet. In southern China, savoury fillings such as salted duck egg, pork belly, taro, shredded pork or chicken, pork fat, and shiitake mushrooms are popular. However, it is not uncommon to come across sweet zongzi, which include ingredients such as sweet red bean paste or sweet taro paste. Peanuts are usually added to both savoury and sweet zongzi. The filled leaves are carefully wrapped into a tetrahedral or conical shape and tied using twine or strips of leaf. The zongzi are then steamed or boiled for anywhere between twenty minutes to several hours, depending on how well-cooked the rice was before it went into the zongzi. Once cooked thoroughly, the zongzi are removed and left to cool. They disseminate an inviting aroma and serve as the perfect comfort food year-round.